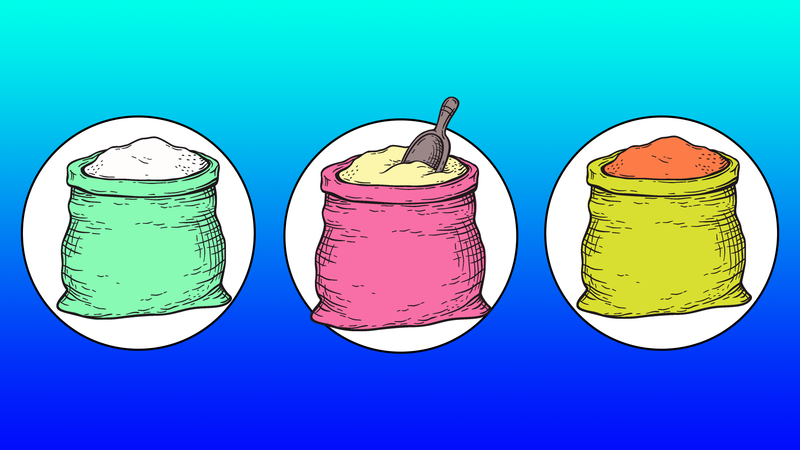 Whether you’re an experienced baker trying to get out of your all-purpose rut or a rookie wondering if those specialty flours are just a marketing gimmick, you’ve no doubt seen the plethora of different types of flours in the grocery store or in recipes you’d like to try. First things first: It’s not a marketing gimmick! Yes, you can use all-purpose flour for any recipe, but for optimum results, you should go for the right flour, and if a recipe was specifically developed with a certain kind of flour in mind, you should either use that flour or a white flour with a similar protein content. Yes, protein content actually matters in your baked goods, even though they’re considered a carb. Each type of flour is slightly different in its protein content, which affects how much gluten can be formed during the mixing and kneading process. The more protein, the more gluten is made and the more structure your finished product will have. So, if you want the spongiest of sponge cakes, you’ll want a low-protein flour that won’t build up a lot of gluten during the mixing process, while yeast breads and pizza doughs in which a chewy texture is desirable should use higher-protein flours to really get that gluten going. It also bears mentioning that white flours are made using only one of the three components of the wheat berry: the endosperm. Whole-wheat flours are made using the endosperm plus the other two components, the bran and the germ. As such, whole-wheat flours can’t be substituted outright with flours of similar protein content because they’re also way thirstier — that is, they need a lot more hydration. Recipes designed specifically for wheat flour will have a ton more liquid, so white flour isn’t a good substitute. By the same token, when subbing in wheat flour, it’s usually best to use a ratio of 50 percent wheat flour and 50 percent white flour. It still might make the baked goods a bit denser, but you’ll have results closer to what you’re used to without upping the water content significantly. In yeast breads, whole-wheat flours also ferment faster because there’s more for the yeast to feed on. 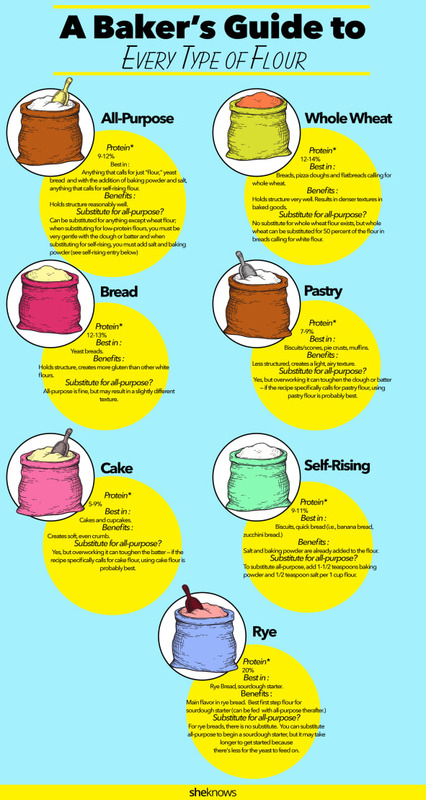 So, before you dust that clean, dry surface with flour again, we’ve put together a simple chart to give you the scoop on each type of flour’s differences, benefits and best uses as well as the drawbacks of substituting all-purpose flour in their place.